If you are looking for some informal professional development, get inspired about your work or just get away for 3 days, then the upcoming regional conferences will be well worth your while. First there are 2 regional conferences one in Philadelphia, PA and the other in Phoenix, AZ. 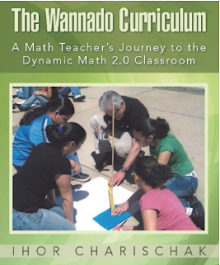 The keynote will be an IGNITE session with seven past presidents of NCTM participating. Should be fun. Too bad it can’t be a debate. The opening sessions is once again an IGNITE session. This time it’s not the presidents though Matt Larson is one of the presenters. Each igniter gets 8 minutes and will preview some aspect of the conference. By now I’m all ignited out, but if you are a fan or new to this format, I’m sure you will enjoy it. Tools and technology IS a strand so there will probably be more technology sessions than is usual. I can’t tell you how many because the full list of speakers is not out yet. 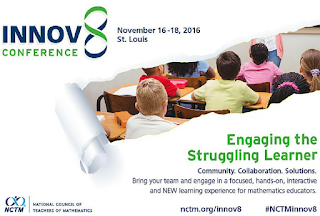 Also this year NCTM is rolling out a brand new and exciting conference called Innov8 which focuses on engaging the struggling learner. Use #NCTMinnov8 to get the latest updates and engage with others about NCTM's new learning experience on social media. A clarion call. I look forward to the twitter blogosphere continuing to become a growing trend as we go further into the 2016-2017 school year. It’s too late to be a speaker, but not too late to participate. 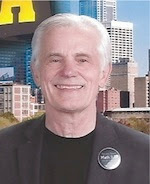 See my blog entry about the conference. It should be great.